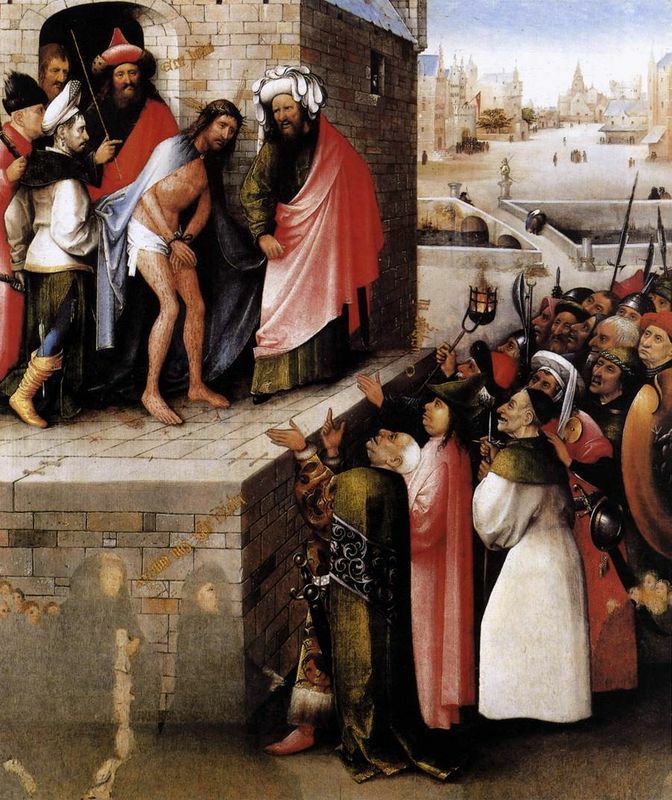 This painting, attributed to Hieronymus Bosch, is dated around 1500 or later. 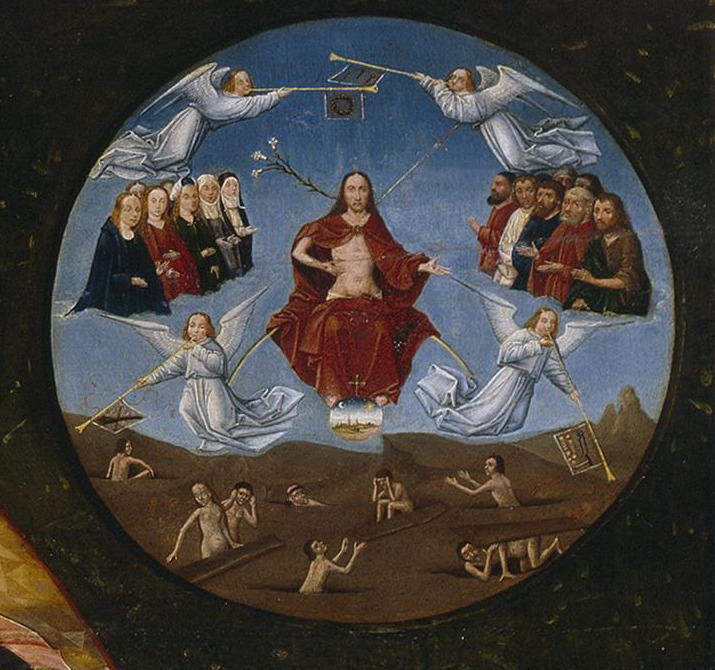 The image is created as a set of circles with a larger sphere depicting the Table of the Mortal Sins. In a clockwise motion, starting with wrath at the bottom, these sins are envy, greed, gluttony, sloth, lust and pride and each is shown through events of misbehavior and vices of the time. In the corners are the final stages of life - the 'four last things' mentioned in late medieval spiritual handbooks, set into a dark background. 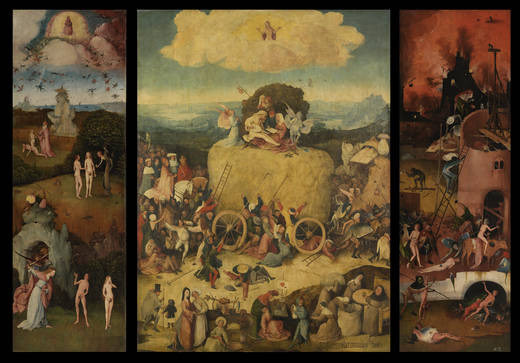 Death, the Last Judgment, Heaven and Hell are favorite themes of separate Bosch panels. 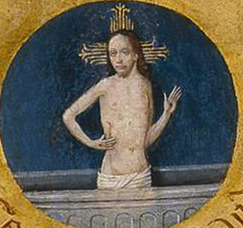 In the center of the large circle, believed to symbolize the eye of God, there is a "pupil" in which Christ is seen stepping out from his tomb, watching the world. The phrase "Take care, take care, God is watching", is written. Above and below the main image are two scrolls with Latin verses from the Book of Deuteronomy 32:28-29 which warn of the consequences of sin. The first, featured above, reads "For they are a nation void of counsel, neither is there any understanding in them," and below reads "O that they were wise, that they understood this, that they would consider their latter end!" This work was intended to be displayed lying flat and its format is reminiscent to designs of stained glass windows. It was acquired by Felipe II and he sent it to El Escorial in April 1574, where it was mentioned by Father Sigüenza. In Table of the Mortal Sins each sin has its own scene. In pride, a demon holds a mirror in front of a woman. As a result of wrath, an angry man is about to kill a woman. The small circles are also detailed. In the corner works Death is shown at the door step together with an angel and a demon while the priest reads the sinner's last rites. In Heaven (also referred to as Glory), the saved enter the kingdom with Jesus and the saints. Saint Peter is shown as a gatekeeper and at the gate an Angel stops a demon from trapping a woman. In Judgment Christ is glorified while angels wake up the dead. In Hell demons persecute sinners in accordance with their sins. For example, in gluttony a man is fed the food of Hell by a demon, and in greed misers are boiled in a pot of gold. Early paintings by Bosch are rather awkward in their drawing and composition and his brush work was somewhat limited. 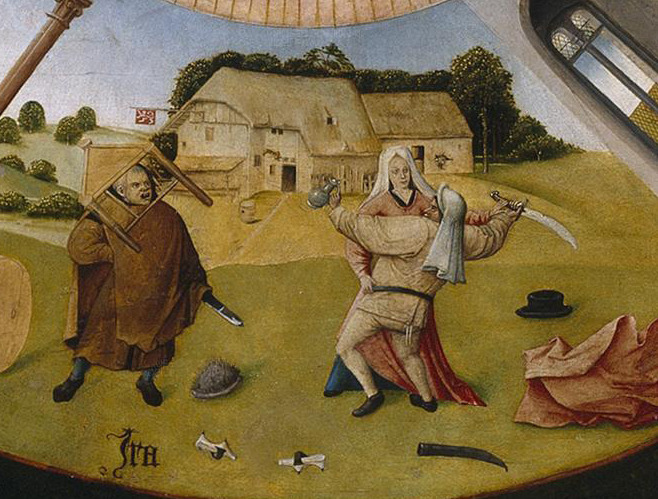 In such works, Bosch portrays the vulnerability of people when tempted by evil or lust. He depicts groups of people as ignorant or absurd when faced with different challenges on life's journey. The imagery he uses, however, is still rather conventional, and it is only in a small number of paintings that strange figures such as demons or magicians make an appearance. 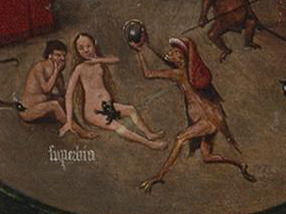 In his early career Bosch relied more on certain motifs and a limited technique which was unsure but at the same time quite bold. His iconography was much simpler in his works from this time and he began to depict humanity's vulnerability to the temptation of evil, sin and lust. Both wonderful and terrifying, his works were unforgettably garish. In works such as Table of the Mortal Sins people demonstrate the innocence and silliness of the human race. There have been many claims throughout the ages that this work did not belong to Bosch but was instead created by one of his pupils. In 1560 Felipe de Guevara wrote about a student of Bosch, a 'discipulo', who was as skilled as his teacher and even signed his works with his name. Straight after this de Guevara mentions Table of the Mortal Sins as typical of his style. 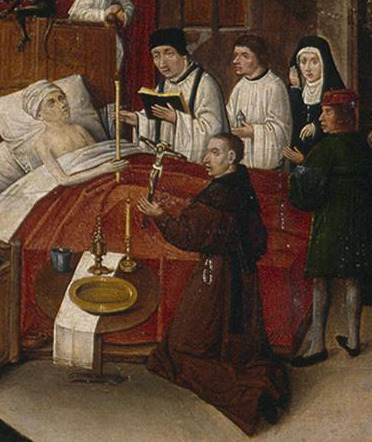 This led some scholars to assign this painting to his pupil. Yet most agreed that despite the context, de Guevara in his writing had returned to a description of the works of Bosch himself and therefore it was believed to be a painting from Bosch's early career. However, numerous costumes featured in the work suggest a much later date, around 1500. 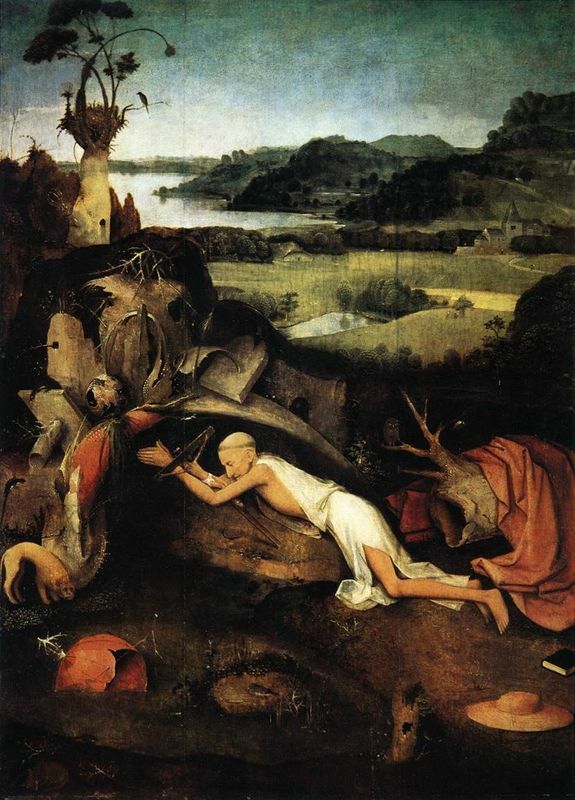 Together with the dendrochronological dating of many of Bosch's panels, the fact that this painting has not been produced on oak and that aberrant techniques are used - such as the use of a ruler - have once again fuelled the idea it is not the work of Bosch himself. Scholars have regarded Bosch's vision as less fantastic, and accepted that his art mirrors the orthodox religious belief systems of his age. His portrayals of sinful humanity and representations of Heaven and Hell are now seen as in keeping with those of late medieval didactic literature and sermons. Thus, most writers attach a greater significance to his paintings than before and try to attempt to interpret it in terms of a late medieval morality. Once opened, this triptych deals with sin and its consequences. 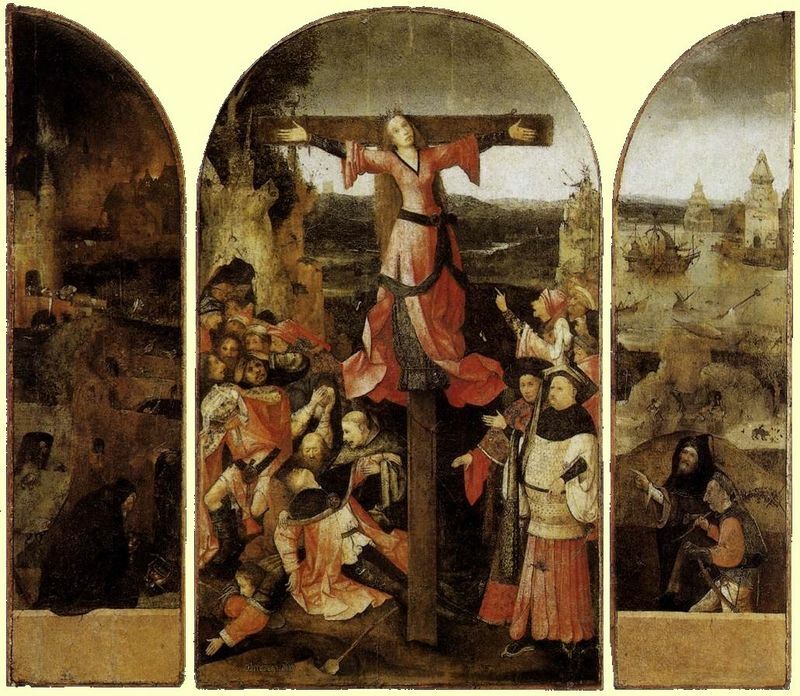 On the left panel the viewer sees the origin of sin on earth, from the fallen angels to Eve's sin and the center panel depicts humanity being dragged into sin. Men and women surround the hay wagon and everyone wants to climb onto it, fighting for a share of the hay. Even kings, bishops and aristocrats pursue the hay wagon. These people feel no shame in engaging in crimes to access the hay and will go as far as killing others to do so. Relying heavily on symbolism and working freely, Hieronymus Bosch created works that expressed the social and political upheaval of his time. An eccentric artist many of his paintings, such as Table of the Mortal Sins, focused on the torments of Hell and his later works in particular were highly original and sometimes offered a literal translation of verbal metaphors set out in the Bible. Bosch's fantastical creations were unusual and many believed that he must have been a morbid soul to have been able to create such depressing images. Yet, Bosch worked at a time when the medieval period was coming to an end and therefore his paintings most probably reflect his anxiety over a changing world. His style was very different to that of Jan van Eyck or Rogier van der Weyden, the two artists who were most influential in the development of style in the Low Countries until around 1500. A lack of information about Bosch, his life and inspirations, further hinders an understanding of his imagery and any interpretation of it. What is known is that during his lifetime Bosch was a celebrated painter and a generation or so after his death his works were eagerly sought-after and collected by Philip II of Spain, the Table of the Mortal Sins being one of them. Many of the paintings Bosch produced are similar to the works created by the Surrealists centuries later. 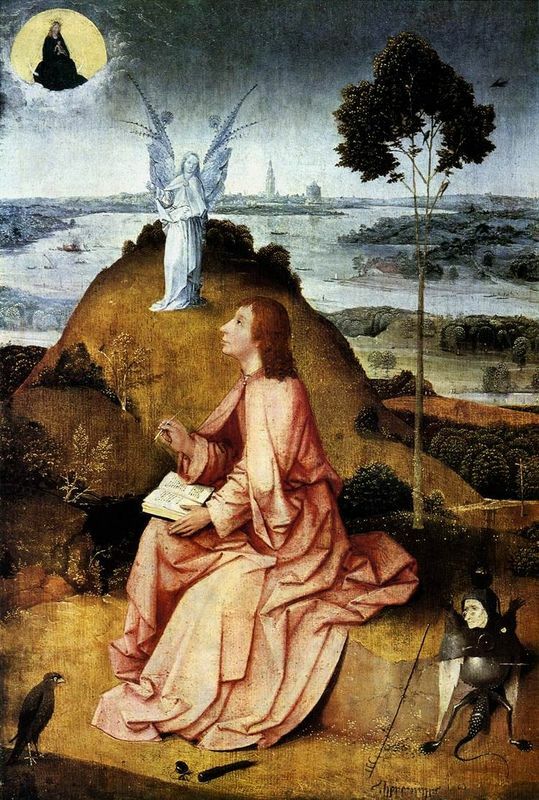 They too paint a world based on fantasy and therefore Bosch's works are Looked at in this way Bosch and his fantasies are strangely modern and thus his popularity among contemporary artists and art fans has been strong. Hieronymus Bosch worked at a time when the medieval period was coming to an end and therefore his paintings most probably reflect his anxiety over a changing world. Many of the paintings he produced are similar to the works created by the Surrealists centuries later. 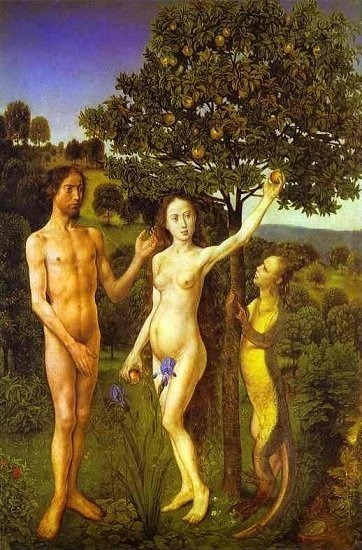 They too paint a world based on fantasy and therefore Bosch's works are strangely modern.